Both the administrative pillar of resistance and the ‘Indivisible’ legislative pillar will be bolstered if linked to a grassroots strategy of cross-issue mobilizing and direct action – the core strategy. 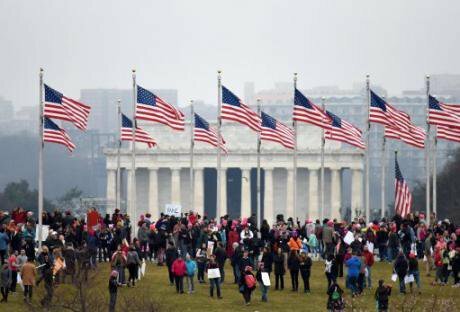 About half a million people showed up for Women's March in the country's capital on January 21 to challenge the new US president. Xinhua SIPA USA/Press Association.All rights reserved. With the curtains closed on the inauguration of the 45th president of the United States, the threat of domestic tyranny looms large. The new US president has denounced protestors and bullied opponents, mocked civil rights heroes, repeatedly threatened independent media, extolled the virtues of repressive autocrats, and appointed family members to positions of power. His business practices may already violate the Emoluments clause of the US Constitution designed to bar foreign powers from buying influence. The Congress, controlled by the president’s party, has recently revived an obscure 1876 rule that would permit the purging of disloyal civil servants. Scholars of authoritarianism, and those who have lived through it, have cautioned against normalizing anti-democratic behaviors. In Russia, Turkey, Hungary, and elsewhere, democratically elected leaders went on to gradually but systematically gut free expression and assembly while undermining checks on executive power. Yale historian Timothy Snyder, an expert on Nazism and the holocaust, offered advice to American citizens: “do not obey in advance” (most support to authoritarianism is given freely), “recall professional ethics” (commit to just practices and take action when they have been violated) and “hinder the one-party state” (prevent parties that have taken over the state from monopolizing control by voting in local and state elections). Masha Gessen, an author of several books about Putin and Russia, insisted you should “believe the autocrat”, “don’t be taken in by small signs of normalcy” and “be outraged”. This inside-outside strategy should stand on three pillars. A group of former Congressional staffers penned the Indivisible Guide to organizing locally to thwart racist and anti-democratic aspects of the new president’s agenda. Drawing on lessons from the Tea Party’s successful efforts to block President Obama’s agenda after the 2008 election, the guide hones in on two strategic components: a local strategy targeting members of Congress and a “defensive strategy” focused on stopping the new president from implementing specific parts of his agenda. The strategy recognizes that the new president will rely on the support of members of Congress to get laws passed. Those members care first and foremost about getting re-elected, and are therefore susceptible to targeted local organizing. The plan describes how to maximize town halls, non-town hall events, district office sit-ins and meetings, and coordinated calls to bolster Congressional advocacy. Members care first and foremost about getting re-elected, and are therefore susceptible to targeted local organizing. The Indivisible Guide, which began as a GoogleDoc and went viral, has inspired the formation of over 4,500 local groups around the country that have committed to implementing the strategy, ranging from established social justice organizations to new groups that formed in the wake of the election. This new national network of local self-organizing groups has tremendous potential to not only engage in targeted advocacy, but to join forces with other grassroots movements and coalitions to support collective action and (if necessary) mass civil resistance to escalate political and economic pressure against the incoming administration. That brings us to the second pillar of the strategy. The Indivisible authors acknowledge that theirs is not a stand-alone strategy. Rather, an advocacy approach targeting members of Congress should be linked to a broader approach to building a more just and inclusive society. That requires grassroots organizing, building broad-based coalitions, and engaging in nonviolent mass action. Already there have been a number of local and state-level initiatives designed to protect those, including undocumented immigrants and Muslim Americans, whose rights may be under threat. At least three-dozen cities, including New York, Chicago, LA, and DC are standing by their status as “sanctuary cities”, meaning they do not ask residents about their immigration status nor detain them on grounds of that status. They refuse cooperation with federal immigration officials seeking to arrest, detain, or deport immigrants solely on grounds of their documentation status. City officials have held fast to their commitment despite Trump’s threat to cancel all federal funding to sanctuary cities within the first 100 days of his presidency. Maryland citizens are working with local police to prevent federal overreach involving discriminatory surveillance, including the targeting of Muslims. Maryland citizens are working with local police to prevent federal overreach involving discriminatory surveillance, including the targeting of Muslims. Single-issue organizing around important issues like immigrant rights, criminal justice and police reform, and reproductive rights, while important, will be insufficient in a political context marked by threats to democratic systems and institutions. Instead, grassroots organizers will need to focus on working across sectors and issues and building broad-based coalitions whose members are dedicated to the proposition that an attack on one is an attack on all. Grassroots movements are also well positioned to support those inside government who may decide to challenge certain directives, rules, or policies coming out of the next administration on grounds that they are either un-Constitutional or unethical. Which brings us to the third pillar of the strategy. The 2.7 million nonpartisan civil servants who run the US government from day to day have tremendous power and constitute a key pillar of support for any administration. Civil servants have unparalleled familiarity with the bureaucratic process. They know how to speed things up, and they know how to slow them down. They have access to critical information about policies being considered and implemented. They can participate in internal decision-making. They can provide (or deny) knowledge and expertise to those at the top of the bureaucratic totem pole. Historically, civil servants have used a range of tactics to challenge government policies deemed unethical or unconstitutional. In his famous “198 Methods of Nonviolent Action”, sociologist Gene Sharp listed actions ranging from the wearing of symbols by government workers, to selective refusal of assistance, to deliberate inefficiency and selective noncooperation by enforcement agents, to quasi-legal evasions and delays, to noncooperation by constituent governmental units. University of Chicago law professor Jennifer Nou wrote about how dissenting bureaucratic actions have been used in the US context. The ‘slowdown’, when employees perform their work but do so at foot-dragging pace, was used during the Reagan administration. Career civil servants in the USDA’s Food and Nutrition Service who opposed the president’s efforts to cut the food stamp budget and declare ketchup a “vegetable” did what was technically required but refused to engage in policy advocacy. Another tactic is ‘building a record’, or working extra hard to create a paper trail to make it more difficult for the administrator to reverse the decision. This approach was used by career officials in the EPA under the Bush administration, who created 600 pages describing legal mechanisms to reduce greenhouse gases despite the Administrator’s expressed skepticism. Civil servants can sue the agency when more subtle approaches fail. This can generate outside support and pressure, particularly when the individual(s) have strong connections to advocacy groups and grassroots organizations on the outside. Border agents from Immigration and Customs Enforcement, who objected to President Obama’s directives regarding undocumented immigrants, saying they required them to violate federal law, took this route. The ‘nuclear option’ involves resigning, which is what some FDA staffers did to protest the Obama administration’s handling of Plan B, the emergency contraception pill. These dissenting options within the bureaucracy have varying levels of moral and legal risk attached to them. As Nou notes, they have been pursued in good and bad faith. Some civil servants who undertook them were punished, demoted, transferred, or locked out of the policy-making process. On the other hand, it is difficult for political appointees to fire tenured civil servants without a costly fight. Given the financial risks involved in engaging in bureaucratic dissent, notably resignation, those considering it should ensure that they have the financial means to endure changes in employment status. This might take the form of a ‘solidarity fund’ established to support civil servants who engage in dissent while working inside the next US administration. Passive reliance on the strength of the US Constitution and its institutions to preserve democratic norms, behaviors, and practices is misguided in the current political context. Both the administrative pillar of resistance and the ‘Indivisible’ legislative pillar will be bolstered if they are linked to a grassroots strategy of cross-issue mobilizing and direct action. That is the essence of an inside-outside strategy. Passive reliance on the strength of the US Constitution and its institutions to preserve democratic norms, behaviors, and practices is misguided in the current political context. While the president-elect spoke of “American carnage” in his inauguration address, while failing to reference any founding documents and their fierce defense of democracy and freedom, now is the time for the American people to rise up and defend their democracy - before it is too late.